In a recent blog entry about the Effect of Calorie Restriction on Body Size, I provided a graphic illustrating the silhouettes of humans corresponding to the various degrees of calorie restriction to which mice are subjected. Of course this was just speculation, or so I thought. 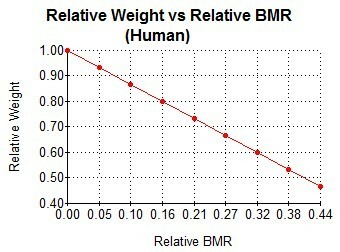 However, after tabulating the Mifflin-St Jeor Energy Equations which are used to calculate Basal Metabolic Rate (BMR) for humans, I found that for proportionally shaped bodies with a Body Mass Index (BMI) of 22, the dependency of weight vs. CR for the humans was identical to the results for the mice. 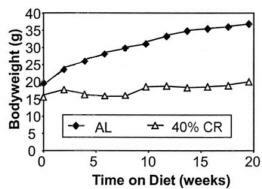 I had previously discussed this anecdotally in my Calorie Restriction page, but with some additional mathematical analysis, I found that the mouse equations could be derived from the human Mifflin-St Jeor equations. I think that there is something intrinsic in the three-dimensional proportions of an organism. Our genes, or Mother Nature, try to balance the way in which our bodies grow based on the level of nutrients. A certain amount of muscle is required for every inch of bone growth, and during our growth, we are not overly lanky or overly squat. If you plant a maple seedling in a big field it will grow to be many feet high, whereas a similar seedling planted in a one-gallon flower pot will grow to be a miniature version of the big tree - a bonsai. And just like you cannot replant the big tree in the small pot, we cannot cut our calories to levels that cannot support our size.